accident contact us today for a free consultation. For more than three decades, Deborah Gold-Alexander has practiced civil and criminal law in the Commonwealth of Massachusetts, maintaining her self-built practice for much of that time in Revere until recently relocating to Lynn’s Seaport Landing. Debbie’s expertise spans virtually all legal disciplines and practice areas from criminal defense and probate matters to complex real estate and business litigation. She routinely counsels individual, corporate and institutional clients on issues involving contracts, torts, conveyancing, commercial leasing, financing transactions, bankruptcy and intellectual property. A seasoned litigator, she has engaged in extensive and sophisticated discovery and motion practice and tried numerous jury and non-jury civil and criminal trials throughout the Commonwealth. Debbie is a registered agent with multiple title insurance companies and approved by the panel of New England Dispute Resolution for mediation and arbitration hearings. 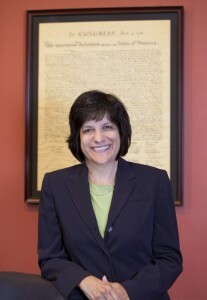 Her professional affiliations include the Massachusetts Bar Association, the National Association of Consumer Bankruptcy Attorneys and the Revere Chamber of Commerce. The Attorney has been appointed by Speaker Robert A. DeLeo to the Massachusetts’ Treasurer, Deb Goldberg’s, Alcohol Task Force. After almost a year of involvement on the Mass. Alcohol Task Force, the Task Force has released many recommendations for reform as reported by the Boston Globe. Here is the link to the full report. The Task Force has been involved in conducting a review of the status of the current alcohol beverages industry in our state and throughout the country and the various regulatory structures. I am pleased to announce that I’ve been appointed to be an Arbitrator/Mediator for the prestigious New England Dispute Resolution Panel! In many law firms, the client may retain an experienced attorney but during the case, the client may have little to no contact with that attorney. Instead, the client may deal primarily with associates (fresh out of law school) or paralegals (non-lawyers) going through their legal process. By retaining this Attorney with more than 30 years of experience, the client has the benefit of a one on one association with a seasoned attorney, taking the client step by step through a sometimes long and sometimes stressful legal process. This personal service affords a comfort factor for the client during his/her case and is important for the continuity of the case. A personal injury can be overwhelming for a person to go through. There is the feeling that he/she has been wronged by another’s negligent conduct. As a result of the negligence, the client was injured and this injury may have prevented the client from working and/or caused the client much pain and suffering. Such pain and suffering can result in loss of life, serious injury, and time away from work. If you’ve been injured contact me today to get started. This Attorney brings more than 30 years of experience in representing individuals and small businesses in suing for monies due them by another party for violating a contract or agreement. The Attorney has also successfully obtained monies due a client on promissory notes and other debts owed that were never paid. The Attorney has also maintained a specialty in representing those businesses in the gaming industry that have been involved in lawsuits because of breaches of agreements and illegal interference with their business relations. The Attorney has represented both plaintiffs and defendants in these types of matters. In this highly competitive industry, it is important to keep a client’s business interests protected. Lynn No-Fault Insurance - When Can I Sue the Other Driver?